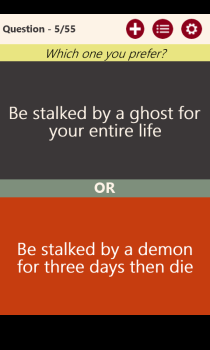 Make a choice is an app with an extremely simple premise. 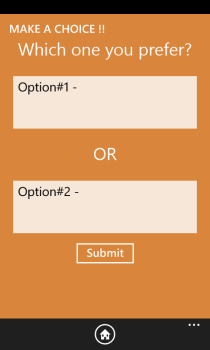 When you start the app you are presented with a choice. 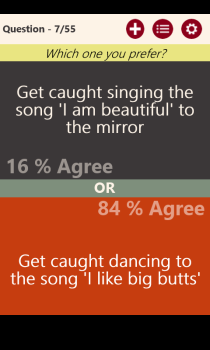 All you see is the question “Which one would you prefer?” Once you tap on one of the two choices you are shown the percentage of users for both the choices. The questions are intentionally meant to make you a little but queasy about answering them. They are by nature casual, candid, funny, plain weird and more than one may give you pause before you answer them. The app currently has a total of 55 questions but the developer says that there are new questions coming everyday. Other features include the option to share the question via email or sms with your friends. 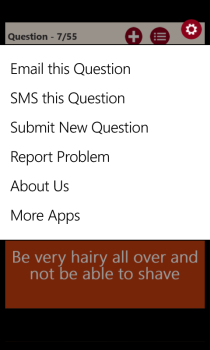 There is also and option to submit a new question to the developer that goes via email. The question may be considered for inclusion as the app gets updated. Visually the app is very plain and barebones with focus on the text and nothing else. There are 3 buttons that run across the top which don’t seem to be finished up too well. The app could do with a little more attention to detail for the one screen app. The app is free to use and seems to be supported by an ad banner that runs across the bottom of the screen. In conclusion Make A Choice!! is an interesting concept for an app. It might make a fun party app where, you might pass it around between friends for a little fun for the evening. Other than that it has a limited appeal and could do with a more spit and polish overall. What would make the app a little more appealing would be if it allowed you to connect with your friends via a social network like Facebook and see what answers your friends gave to some questions with their permissions. Or even a summary that said “x% of your friends chose this answer” would increase the appeal.